UPDATE: Although RFS is no longer the organizer of this annual event, the work goes on! "Build week" is usually the last week of September. Volunteers are always welcomed! An engineer and a marketing expert have teamed up to create this Rockland-based non-profit group: WindowDressers. 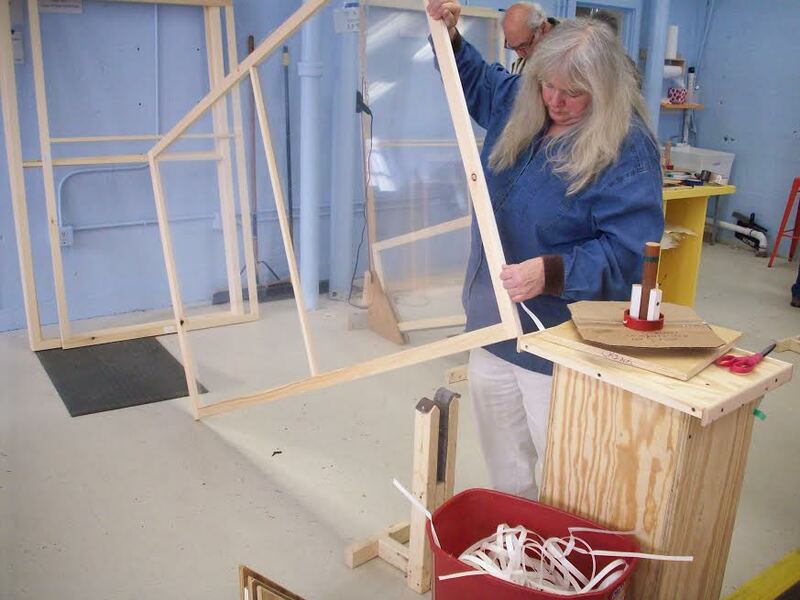 The initial fabrication takes place in Rockland (cutting and assembling the frames). But the actual fabrication of the interior 'storm window' takes place in our community. WindowDressers provides all the materials, equipment and training to build the product, as well as handling all the money transactions. We have created a satellite center in our community, and we're receiving positive responses from many folks as they learn about the program. This initiative is expanding at a pace beyond WindowDressers' production capacity. Its business model makes it economically viable without outside funding sources, although grants would greatly increase the amount of help provided to those with low incomes. WindowDressers involves a technologically sophisticated process. One example of the technical wizardry is the laser measuring of the windows; the resulting data is entered into a program on a laptop which, in turn, instructs a laser operated saw to size and label the sash. November 2017 Newsletter - at pages 5-7 - for photos and brief look-back at 2017 build week. Phase 3: Build Out and Delivery (July 2015) We need volunteers for October; please join in! December 2014 update memo for those interested in the organizing effort - planning, volunteering, ordering.